Lindsey Fussell, Ofcom’s Consumer Group Director said: “We want to help telecoms and TV customers take full advantage of the products and deals out there. 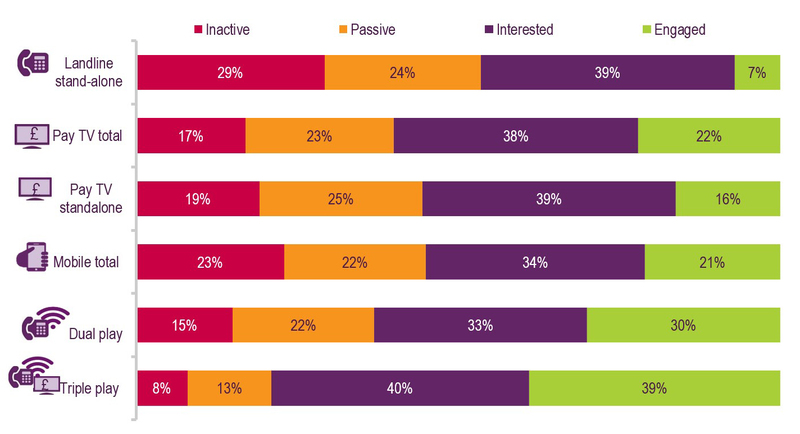 Inactive: people least likely to have had past involvement in the market. They may have switched, considered or negotiated, but not in the last two years. These consumers tend to say they have no interest in changing provider. Passive: more likely than ‘inactive’ consumers to have switched, considered or negotiated a deal, but not in the last two years. These consumers indicate some current interest in the market, such as saying they are open to the idea of a new provider. Interested: broadly similar to ‘passive’ consumers in past behaviour, but they may have shopped around previously. This group is more likely than ‘passive’ consumers to be open to the idea of a new provider. Engaged: these are people who have been the most active in switching, considering, shopping around or negotiating over the last two years, and who are also interested now in what the market has to offer. They may be actively looking for a new deal, or open to the idea of a new provider. 87% of landline-only consumers, 78% of pay-TV-only consumers, 42% of dual play consumers, and 43% of triple play consumers were found to be outside their minimum contract period last year. (See Ofcom’s Pricing trends for communications services in the UK 2016). We estimate the costs to industry to implement our proposed reforms would be around £110m over ten years. We have also considered that these increased costs might lead to higher prices, or reduce operators’ ability to invest in their networks and quality of service. In reaching our decision, we have also taken account of the fact that our proposed reforms would only benefit two fifths of landline, broadband and/or pay-TV switchers. In addition, other interventions proposed since publishing our consultation - such as automatic compensation – may help reduce loss of service for people switching services between networks. Further, there is evidence to suggest that factors outside the formal switching process may be preventing or hindering consumers from engaging in communications markets. Our work on increasing consumers’ engagement will look at these.